Have you ever experienced those times or circumstances when you’ve “checked out” mentally or been tempted to? How did this affect your ability to love or serve those around you? Um, yes. When I feel stressed and overwhelmed, my last resort is to check out. It's a defense mechanism, a signal that I can't take any more pressure. I'll throw up my hands and think, "Whatever." "Never be lacking in zeal, but keep your spiritual fervor, serving the Lord." Somehow I don't think that "Whatever" is a response that pleases God. Whether we mean it as an expression of indifference or begrudging compliance [with someone else's demands], it's not compatible with serving Him with spiritual fervor. I know that God will give me the grace I need to deal with stressful situations. I just need to take hold of that grace and apply it, instead of checking out. 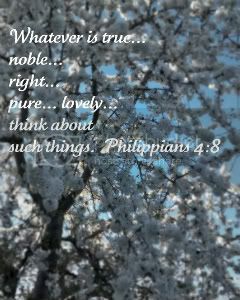 Maybe, instead of stopping at "Whatever," I should take the opportunity to re-focus on "whatever is true, whatever is noble, whatever is right, whatever is pure, whatever is lovely, whatever is admirable...."
What about you? Have you ever experienced those times or circumstances when you’ve “checked out” mentally or been tempted to? For more, visit At the Well for We Are the Body. Definitely. Haven't we all done that at one point or another? Life is not easy and as hard as I try to stay optimistic and positive there are so many times that life throws me challenges and obstacles that I'd rather not deal with. Thank you so much! This is exactly the message I needed a refresher on at the perfect time. Praise God for his guidance. Wow my dear you always know the right thing to put up for me. We're doing the One Church One message and this week they played a Video of the Pastor from Hillsong a HUGE church. He was talking about the end of journey is the end that your done check out. That finding those hard times and what can go on from there. Believe me these days I'm stressed and want to just run away but then I think who else will take care of the family. Then I get overwhelmed thinking about being the only one taking care of everything. UGH I'm putting it in his hands and know the best will come soon. Great post! I do the same just throw my hands up and say I give up! But I am learning God extends His grace to help me. I used to check out a lot when I was married. It was an emotionally abusing and stressful situation. Checking out was my passive aggressive way of saying enough is enough after I had tried living by scripture. Guess I shouldn't have given into that. Most recently, I've been checking out 'cause of stress. I don't do it with everyone and I make a conscious decision to check back in. I don't live the scripture though 'cause I never deal with whatever it is. Rampage or quiet both equal to checking out. I would love to check out right now - my in-laws and I simply don't get on...I really like your suggestion "Maybe, instead of stopping at "Whatever," I should take the opportunity to re-focus on "whatever is true, whatever is noble, whatever is right, whatever is pure, whatever is lovely, whatever is admirable...."